In the previous post, we have talked about partitions. This time, I’ll share a little bit about various screens. 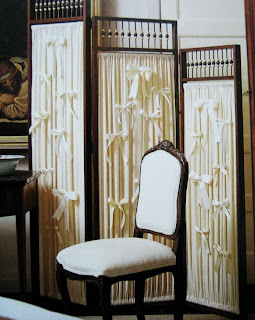 Screens as dividers have been used effectively for centuries. They have been hidden behind, dressed behind, used as a decorative element or for disguising eyesores and deflecting winter draughts- all manner of tasks where non-permanent screening is appropriate. The screens discussed here will provide you with the basics for screen manufacture. This snaky little contraption can go anywhere. Timber strips are nailed back-to-back over a canvas sheet. The strips are standard 30x9 mm cover battens 1.8 meters in length and spaced 9 mm apart. To make the one shown (1.8 meters long) you need 92 of them. This beautiful screen comprises three stepped panels which are hinged together. The frame joints should be dowelled and glued. 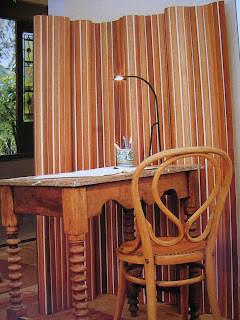 The calico fabric is adorned with bows (you could use a different fabric) and the timber is stained brown. A variation on the beaded screen uses solid panels. The screens shown here are made from ply or edged particle board hinged together. The hinges can be placed on the edge or on the face of the panels. Any number of panels could be linked in this way. Another variation could use louvred doors, while a framed and paneled screen is yet another option. The joints for the 42 x 19 mm framing can be butted and dowelled. Or they could be mitred with a half-tounged mortice as shown. The panels can be of three ply 0r 6 mm particle board which sits in a groove in the frame.